Burdocks have very large pointed-oval leaves and spiny thistle-like flowers. The flowers are succeeded by the fruiting heads which are covered with hooked spines. These spiny heads or 'burs' give the plant its name. They have developed as a means of fruit dispersal, latching on to animal fur or human clothing. 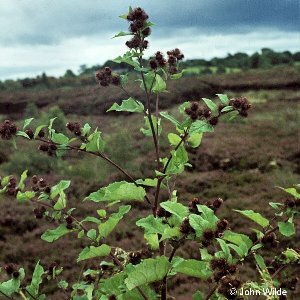 The lesser burdock is by far the commonest burdock in Northern Ireland. 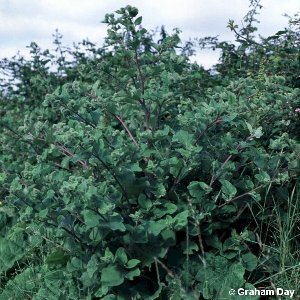 It is a plant of roadside hedge banks, woodland margins, waste ground and streamsides. All names: Arctium minus (Hill) Bernh. ; Arctium minus agg. Bernh.